Happy Birthday to Serena Williams! Sis turns 37 today so here’s 8 moments she’s displayed her black girl magic. 1. First things first, when her catsuit was banned from the U.S. Open, she responded by showing back up in a tutu. And it was not your ordinary tutu, designed by Virgil Abloh in collaboration with Williams for Nike’s “Queen” collection, which she styled with a pair of shimmery silver sneakers, a leather jacket with a utility strap, and a matching tennis bag that was read “AKA QUEEN”…. Just to give y’all the details for this drip. One outfit banned and she showed up to shut it down in a tutu! 2. That one time she won a gold medal and hit the crip walk for her victory…. This was for the culture. 3. When she slayed us on the cover of the first “Badass Women” issue for InStyle Magazine. 4. Dancing along Beyonce in her ‘Sorry’ music video during the release of the Queen Bey’s visual album ‘Lemonade,’ it was a good day in the land of #BlackGirlMagic when we all witnessed this. The song was about strength and courage and she is the perfect example of that. 5. Let’s not forget her first win in March beating Kristyna Pliskova, after just giving birth just last September. The woman does it all! 6. And in case you didn’t know, she is also the highest paid female athlete in the world according to Forbes! 7. 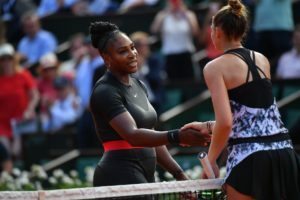 That time when Serena had to check tennis umpire, Carlos Ramos, for accusing her of cheating and getting side coaching. She received a lot of backlash for it, but it was inspiring to see her defend herself. She even kept the same energy after being fined $17,000 during a press conference, arguing that she’s fighting for women’s rights. 8. 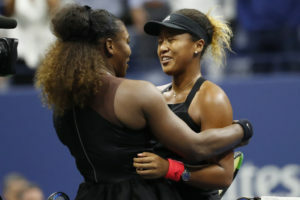 Naomi Osaka beat the greatest tennis player in the world during the US Open finals. Many argue that the umpire assessed Serna with multiple code violations. Either way, it was a historic win and Serena embraced Osaka, who looks up to her, in the heartwarming photo below. Happy Birthday Serena Williams, continue to show off your #BlackGirlMagic and teach us how!